Secret Rabbit Code Resampler for Foobar2000. The plugin only has two items requiring setting. Converter : The Rabbit has a number of different converters. Most people should be using the Best Sinc Interpolator. If this converter uses too much CPU resources on your system choose one of the other Sinc Interpolators. Output Sample Rate : The output sample rate supported by your audio outputs. 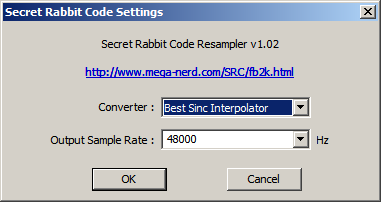 If you're using the Secret Rabbit Code Resampler plugin for Foobar 2000 and think its the best converter you have, you should consider donating US$10 to ensure that this plugin continues to be updated as new versions of Foobar are released. If on the other hand, you are an equipment manufacturer or system integrator that ships this plugin with equipment you sell, please consider obtaining a commercial use license. Manufacturers and integrators who pay for a commercial use license will get timely updates when new versions of Foobar are released and are also free to tell their customers that they do not need to make a donation. Note: This version of the Foobar plugin uses version 0.1.2 of libsamplerate and hence does not contain the drastic sound quality improvements that were introduced in version 0.1.3 of libsamplerate. For an explanation of why the plugin hasn't been updated, see here.